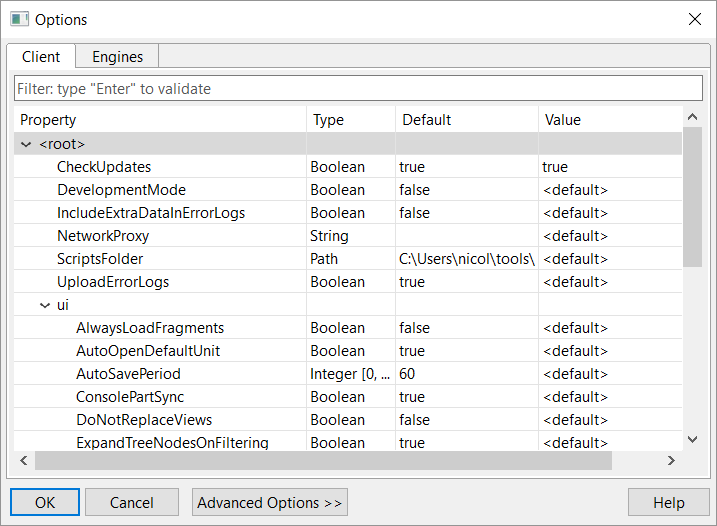 The UI client stores its client configuration, also known as the front-end configuration, in bin/jeb-client.cfg. The configuration file is a key-value store where keys are fully-qualified identifiers that start with a leading dot. The public keys can safely be changed by a user. They are accessible in the Options dialog, Advanced mode, panel Client. Description: Increase verbosity and error messages. Recommended when developing JEB Extensions (plugins or scripts). Description: Network proxy settings for JEB client components. The format of this property is: 'type|hostname|port|user|pass|whitelist'.